The first thing I must share is that when you are on a road trip – don’t plan for anything to be set in stone – we did not and I was glad to have the extra time to be able to visit this unique location! This was our first National Park planned stop on our road trip. 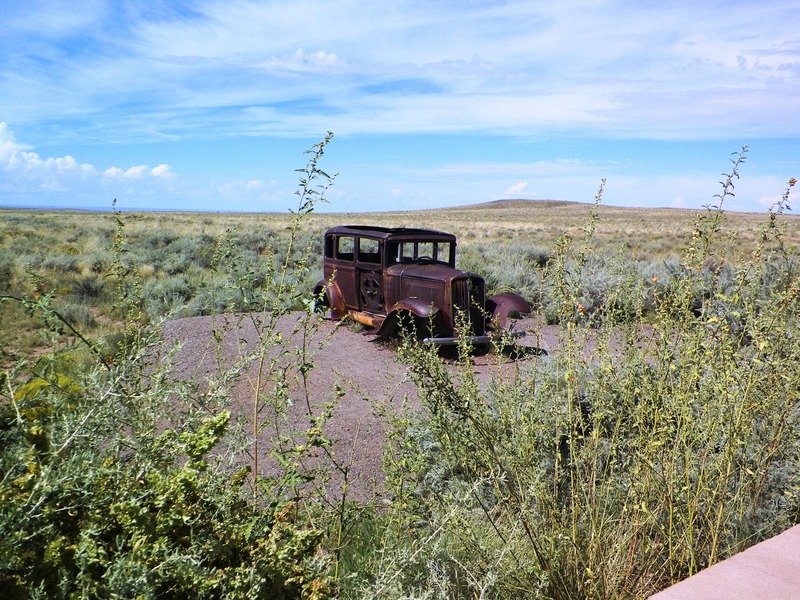 We had not planned to spend a lot of time here thinking there was not much to see and noting that we could just drive through thought we would be able to see most of the highlights of the park – was I ever wrong! We arrived at the gate not far off of Hwy 40 (old Route 66) Exit 311. 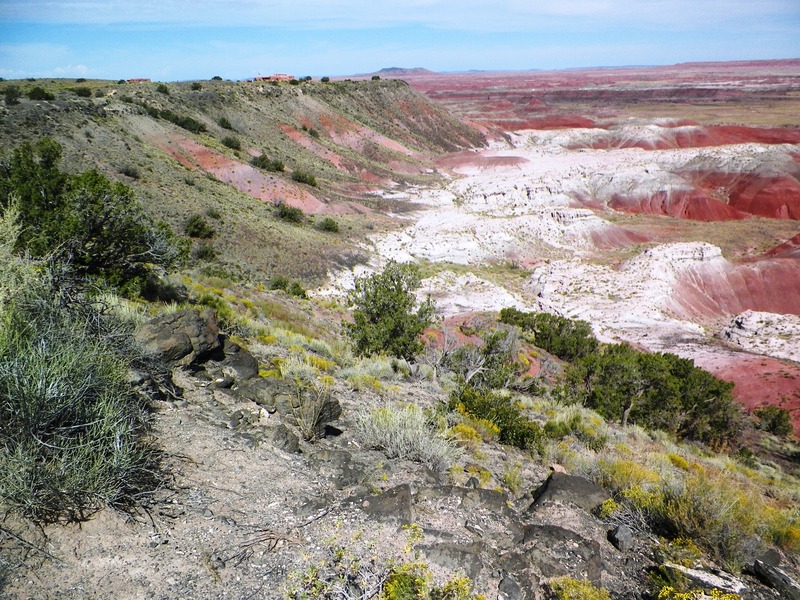 This brought us in on the Painted Desert portion of the park. A made a quick stop at the visitors center to get our National Parks Passport and to get it stamped, watch the 18 min introduction movie and get a few souvenirs. It was then, after speaking with the ranger I knew we would not be here just an hour or so! 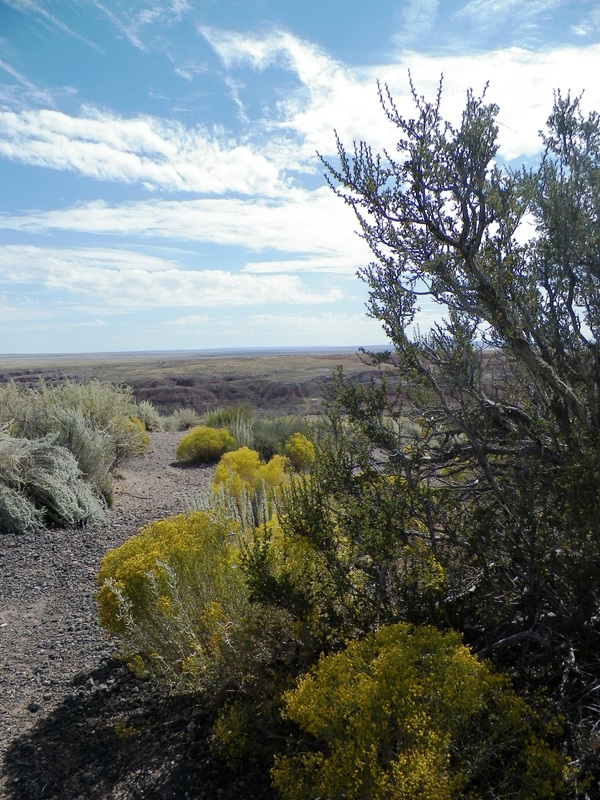 The park stretches for 28 miles between Hwy 40 and Hwy 180 where we would then travel west again to our next stop Holbrook. 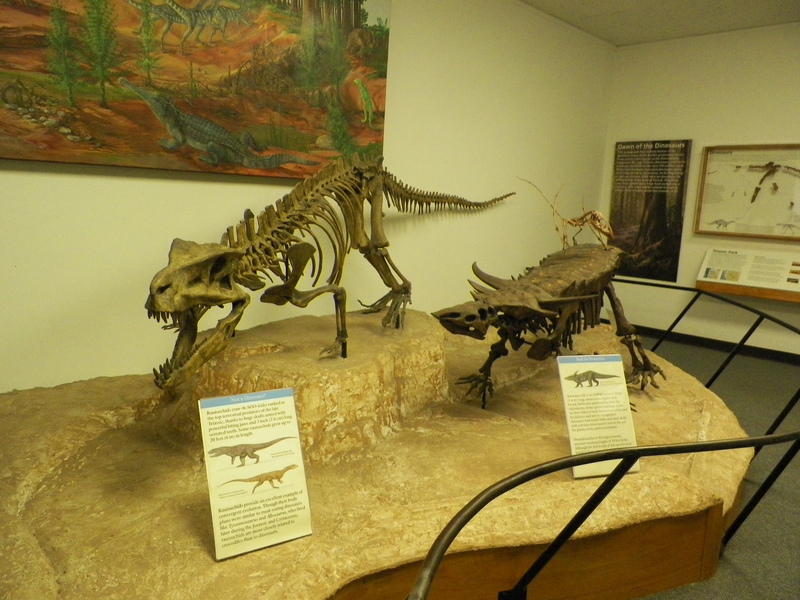 An average visit here is 2-5 hours – I wish I could have spent a full day. There are many back country hikes and ranger led programs you can plan to do if one has the time. There are 7 maintained trails an you can hike the back country as well. 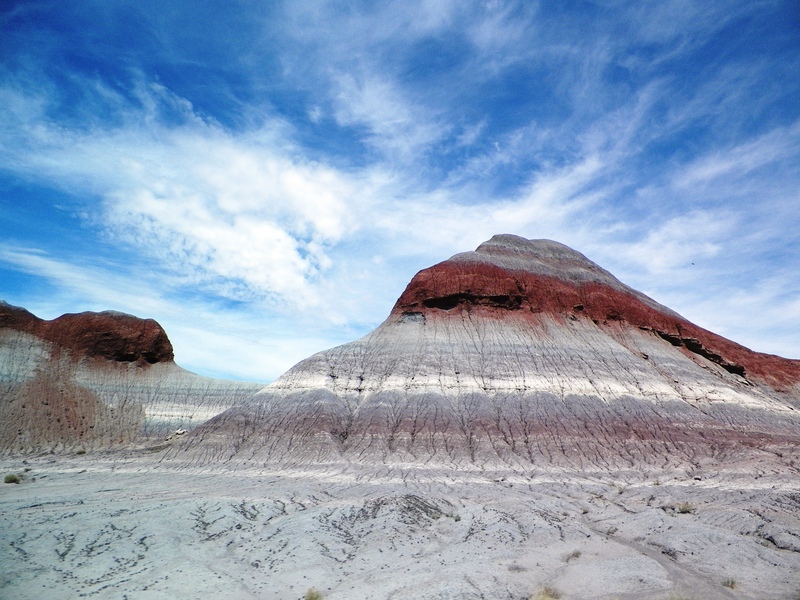 There are about 25 lookouts or stops along the way if you include the Blue Mesa loop (a must see!). After a few more breathtaking stops we were about to cross hwy 40 /Rte 66. There was a pull over here with the rusty shell of a car looking out towards the new highway, a reminder of a slower time in our not too distant past. 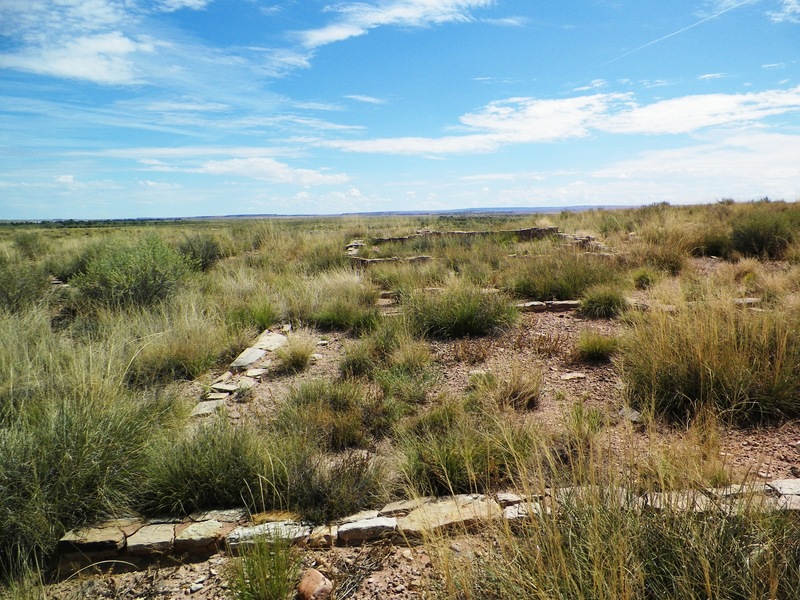 Our next stop was Puerco Pueblo where we got a peek back in time to an ancient Pueblo ruins that housed over 200 residents and we learned more about them and got our fist look at petroglyphs. They are putting in a new interpretive building which from what we could tell would be open soon. Just a few more moments down the road was Newspaper Rock. 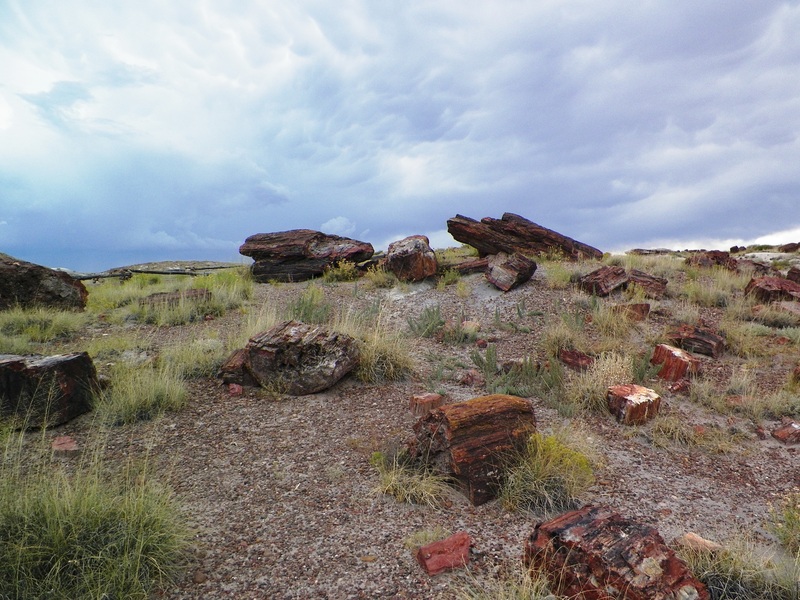 These are the two spots where you can see petroglyphs in the park and this stop is not to be missed. 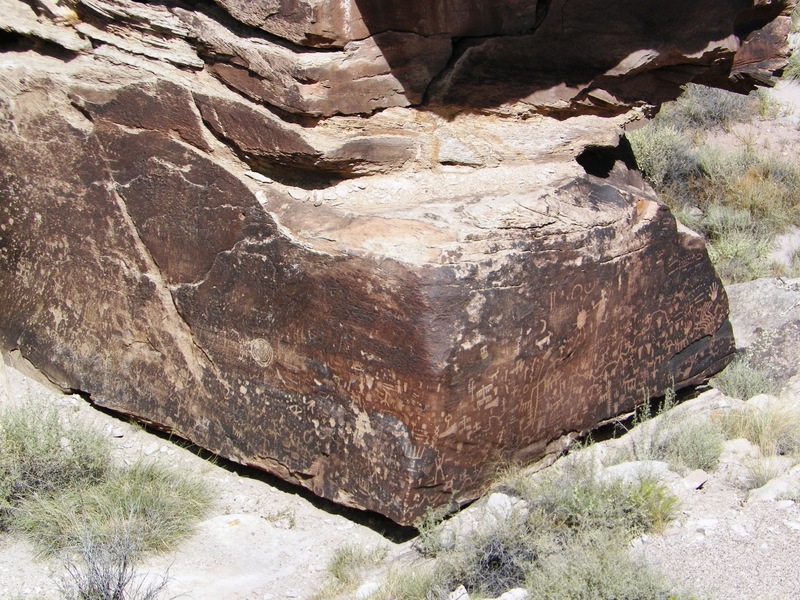 There are hundreds of individual markings in clear view on the rocks in this area. Many of these drawings relate to solar calendar events believed to be from approximately 1300 A.D.
Other stops along the way were Jasper Forest, Agate Bridge and the Crystal Forest – each stop brought more wonders for the eyes and imagination. 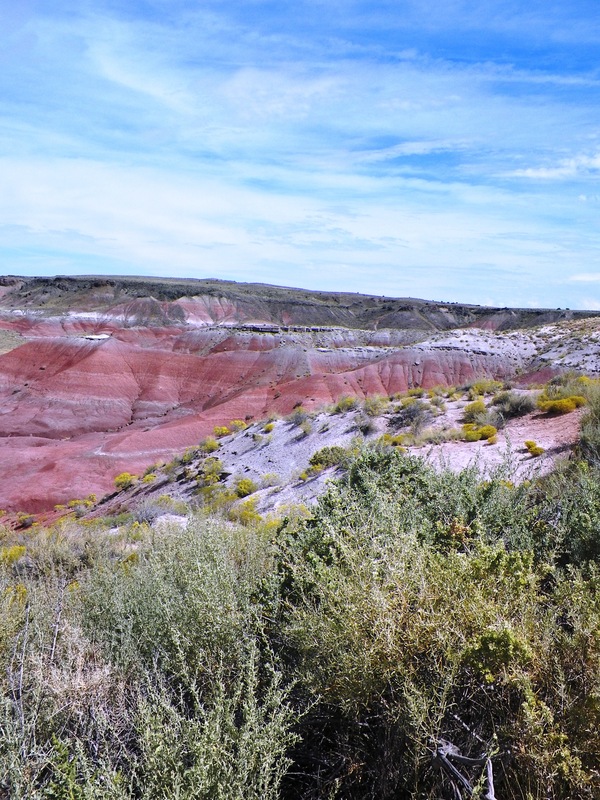 So hard to believe this was all a vast tropical forest during the Triassic Period. 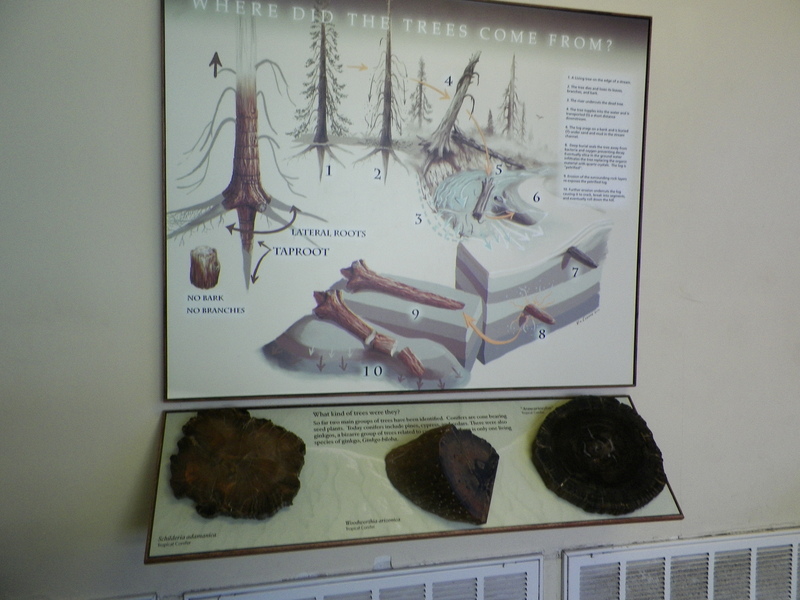 After hiking trails at the last 2 stops we headed down to the visitors center at the south end of the park – The Rainbow Forest Museum. There we found wonderful interpretive displays, the ranger on duty, very nice young man (I hate that I can’t remember his name) was very knowledgeable and we spoke for quite some time about the geology and history of the area. We even answered a few questions he had about our American Alligators. Rob and I then took our final hike on the trails surrounding this area. 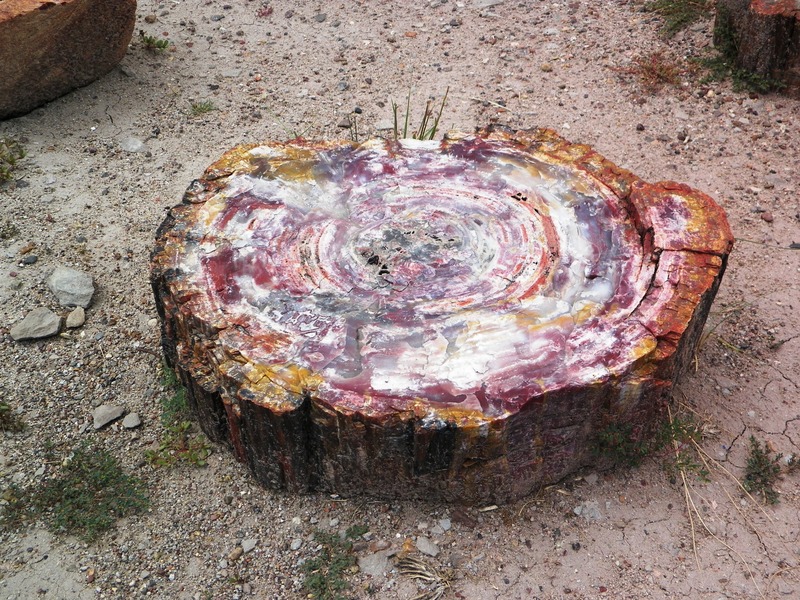 The petrified trees (now solid quartz) were full of color and they had some absolutely amazing pieces here o display. There were wildflowers blooming all around from recent rains and many different lizards scattered about running on and out of shaded crevices in the rocks. Unfortunately we had to get back to the car and head out. There was a storm brewing and would be upon us shortly so after a few more photos we were back on our way. Rob and I had much to talk about in the time we had in route to our next stop. Amazing the things that come to mind after a visit to such an awe inspiring place. 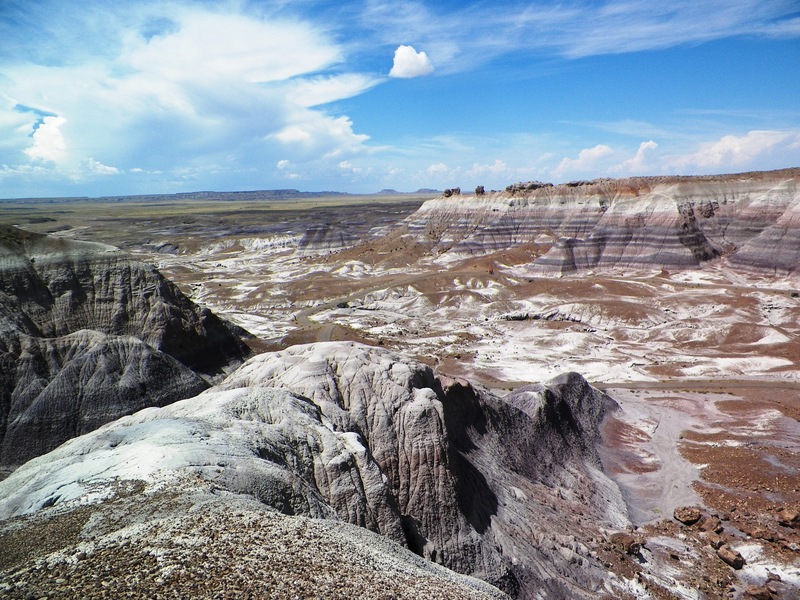 This is not just a park of dead trees and rocks, it’s is a place of unique beauty, a living history lesson and a place that you will forever hold a special place in your memories of. Jeanene was born in Pittsburgh, PA. As a young child her family was very active in the outdoors. Things changed when her parents decided to travel down different paths in life and with that decision so went many of the opportunities to enjoy the outdoors. Being lucky to live in the suburbs Jeanene always had a backyard to play in and loved being outdoors. As the years passed she took every opportunity to be outdoors. She bought land in Tennessee and as a single mom moved her young daughter to the mountains. The were many life lessons learned on that mountain. There was no plumbing on the property – or even a house, but that did not stop her. She learned to live off of what was available and built her own cabin from the trees on her property. Those were rough years but the most rewarding. Now Jeanene resides in Tampa, Fl. and works as an office manager full time….but still yeans to be outdoors. Jeanene started “Not a Clue Adventures” to teach everyone she could how wonderful the outdoors are! That camping and fishing and hiking can be done by everyone and at many different levels. Single mom’s no longer have to be afraid to take their sons and daughters outdoors. By working with young couples, single parents and even seniors, she gets to teach others about her love for the outdoors and hopes to open their eyes to new adventures. In 2009, Jeanene completed certification as a Leave No Trace Instructor. She also works closely with the National Wild Turkey Federation (NWTF), Florida Fish and Wildlife Commission (FWC) and the Florida State Parks. Jeanene is also certified in First Aid/Adult CPR. 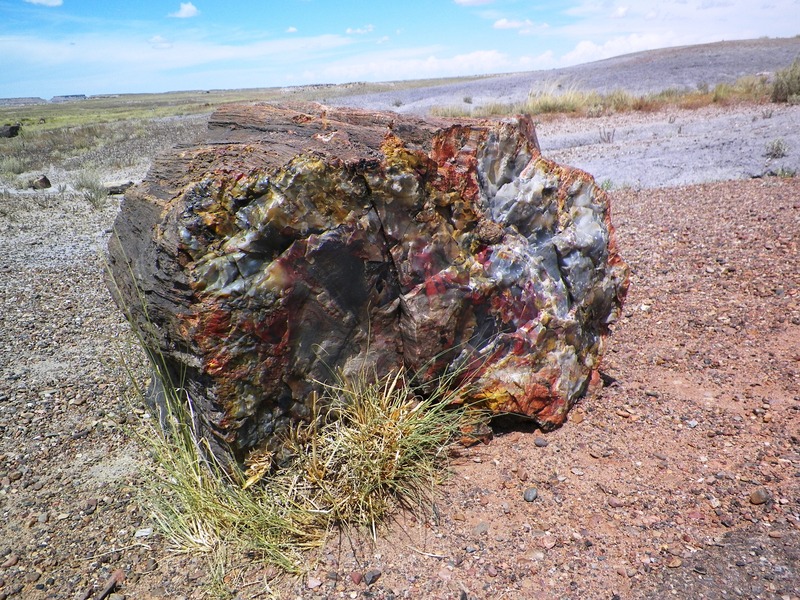 This entry was posted in Travel and tagged Arizona, National Park, National Parks, Painted Desert, Petrified Forest, Road Trip. Bookmark the permalink.